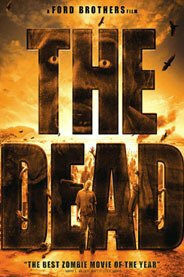 I wrote an article called “The Best Thirteen Weirdest Zombie Movies” a few months ago and this movie (The Dead) was #11 on my list. I didn’t have a dialogue to go with it, so I decided to write a movie review. The Dead takes place in West Africa. A military engineer, Lt. Brian Murphy (Rob Freeman), finds himself surviving in a land of zombies after his plane crashed. He meets up with Sgt. Daniel Dembele (Prince David Oseia), who is looking for his son. Together they set off on a journey to find other survivors and a way to get out of the nightmarish hell. I’m not going to go into much detail. This movie was filmed on 35mm by an award-winning Ford brother and shot in locations of Burkina Faso, French-speaking West Africa, Ghana, and also in the Sahana Desert. To me I felt that I was watching a documentary on how to survive a zombie outbreak, as I found this movie filled with lots of emotions from both characters. It made me think about what I would do in the situations they faced. This movie contains a lot of violence, so its not for the sensitive. If you like unique international films, then this one is for you. Check it out on DVD. Comments for DVD Review about “The Dead” movie are now closed.